Rab Women's Apparel Clothing Shed Helix Pants Wmns Graphene Size 16 Short Leg QFS97GR16XSDEMO. The Helix Pant is made with Matrix single weave stretch fabric featuring knee articulation and regular fit for ease of movement. Lightweight and quick drying they are perfect for summer situations where the weather is variable. UPF 35+ protects from the sun while the roll up leg function offers an extra option on warmer days. 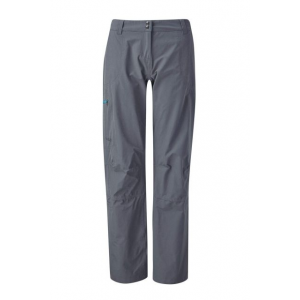 Two open hand pockets one YKK zipped thigh pocket plus two rear patch pockets offer ample storage for all the essentials.Whether you choose sport on the slate cragging in the Llanberis pass or a long hike in to multipitch trad routes the Helix pants will keep you climbing through sun and showers.